Illegal wildlife hunting, poaching, bushmeat harvest and trade, and deforestation are now considered as the most significant cause of biodiversity loss in Africa. This assertion is even more evident in the central African sub-region where the phenomenon has within the past years taken crisis proportions due mainly to economic and social strife, political instability and armed conflict, and acute urban exodus. The nefarious effects of global warming are also aggravating desertification within sahelian ecosystems pushing larger numbers of people to migrate towards richer pastures, thereby increasing pressure on faunal and floral resources within these areas. 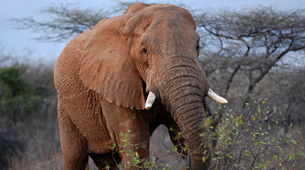 The Waza National Park in the north of Cameroon is home to about 2,000 of Cameroon’s 22,000 elephants. This protected area is widely known for its important population of elephants that migrates widely between protected areas and surrounding support zones, and some highly endangered species like the Giraffe, Cob, Roan antelope and hartebeest. However, this area continues to be threatened by poaching activities, bush meat trade and pressure from expanding human population that bring with it high demand of land for agriculture especially cotton development and subsistence farming. Only five poorly trained guards are in service to monitor and protect the wildlife in the 170000 ha of the National Park, with no signs of amelioration due to a World Bank imposed national freeze on the employment of new government paid staff. More over, a recent boom of the “coupeurs de route” (gangsters) have used their weapons for wildlife poaching in those protected areas. Aerial surveys carried out in February 2005 reveal that a significant portion of the Park is now being used by migrant tribesmen as grazing land for cattle, while field studies point to a sharp increase in poaching and bush meat trade, and fuel wood exploitation. Immediate action must be taken to improve law enforcement and awareness within the park and its immediate environs. General awareness of species conservation remains extremely limited and where it does exist, understanding of the issues often bears little resemblance to the reality of conservation of animals in their wild state. Likewise, consumption of wild animals continues with a corresponding negative impact on wild animal populations and on efforts to ensure their effective conservation. Without an integrated approach, addressing both enforcement and education and awareness it is apparent that trends on bush meat trade of many species will continue on an upward curve. This project will strengthen Waza NP personnel’s ability to enforce wildlife protection law, and monitor and manage wildlife populations, carry out sensitization campaigns using local and national media, and gather baseline surveillance data for long-term monitoring of wildlife populations.